United Auctions, Stirling (Wednesday August 23) sold 1173 store cattle also forward 121 cast cows. Bullocks (662) -averaged 220.01p to 272.4ppk for a 290kg CHX from The Firs and £1400 for a 681kg AAX from Burnhouse. Heifers (458) – averaged 210.02p to 239.4ppk for a 355kg LIMX from Bargany Farms and £1235 for a 576kg CHX from Netherhillhouse. Cast Cows (90) averaged 131.85p to 181.2ppk for a =LimX from Ballinloan and £1370 for an LIMX from Upper Spittalton. Dairy Cows (24) averaged 103.83p to 134.6ppk for a HFX from Nyadd and £945 for a HFX from Nyadd. Forward Cattle (7)- averaged 146.22p to 179.60ppk for a LimX from Ballikinrain and £1190 for a PAX from Drumelzier. Bullocks: Up to 250kgs- Drumelzier £550, 243.4p; 251-300kgs- The Firs £790, 272.4p; 301-350kgs- West Shawtonhill £860, The Firs 261.1p; 351-400kgs- Kincraigie £1030, 263.4p; 401-450kgs- Gateside £1075, Gaisland 249.40p; 451-500kgs- Bloompark £1110, Ladybank 237.50p; 501-550kgs- Blasthill £1210, 229.20p; 551-600kgs – Burnhouse £1290, Bloompark 224.10p; 601-650kgs- Benthead £1280, Knockeffrick 205.30p; 651-700kgs- Burnhouse £1400, 205.60p. £ per head- Lathangie (CH) £1190; Upper Spittalton (Lim) £1370; Hole O Clean (Sim) £1290; Lathrisk (BRB) £1350; Drumoider (Luing) £1130; Dalbrack (BS) £915; Nyadd (HF) £915. PPK- Hole o Clean (Sim) 163.30p; Middle Coldrain (CH) 166.7p; Ballinloan (Lim) 181.2p; Burnside of Balhaldie (BS) 135.10p; Lathrisk (BRB) 156.6p; Drumoider (Luing) 143.8p; Nyadd (HF) 134.60p. £ per head- Doldy (Lim) £1430; Killelan (CH) £1310; Mountquhanie (AA) £1250; Thomanean(Sim) £1250. Dingwall & Highland Marts Ltd, Stornoway (Wednesday August 23) sold 3,493 store lambs and feeding sheep. Cheviot lambs (695) averaged £42.65 and sold to £60.50 gross from 27 Melbost, Stornoway & Cliff House, Laxay. Texel cross lambs (281) averaged £48.72 and sold to £60.50 gross from 1A Upper Bayble, Point. Suffolk cross lambs (365) averaged £46.66 and sold to £60.00 gross from Glebe Farm, Upper Barvas. Blackface lambs (1081) averaged £34.63 and sold to £48.00 gross from 6 Valtos, Uig. Cross lambs (836) averaged £38.83 and sold to £54.00 gross from 14 Gravir, Lochs & Glebe Farm. Stornoway: Chev – 5A Branahuie, £54.50; TexX – 8 Maryhill, £54; SuffX – 5 East Street, £44; Cross – Stoneyfield Cottage, £48. Harris: Chev – Atlantic View, £41; SuffX – 15 Northton, £53; BF – 17B Leachkin, £43; Cross – 2 Scaladale, £47. Westside: Chev – 39 Lower Barvas, £48; TexX – 43 North Shawbost, £53; SuffX – 25 Lower Barvas, £54; BF – 45 Arnol, £45; Cross – 45 Arnol, £51.50. Back: Chev – 15 Vatisker, £54.50; TexX – 2B Back, £56; SuffX – 8 Coll, £39.50; BF – 15 Vatisker, £45.50; Cross – 1 Vatisker, £44.50. Lochs: Chev – 30 Gravir, £51; TexX – 30 Gravir, £57; SuffX – 30 Gravir, £55; BF – 30 Gravir, £46; Cross – 47 Balallan, £51. Point: Chev – 10A Portvoller, £54; TexX – 50 Garrabost, £58.50; SuffX – Sheshader, £43; BF – 7 Hacklett, £41; Cross – 16 Knock, £50. Uig & Bernera: Chev – 1 Carishader, £43; BF – 4 Kneep, £44. Ness: Chev – 43 Habost, £45; Cross – Park House, South Dell, £43.50. On Thursday August 24 Dingwall & Highland Marts Ltd sold 13,469 store lambs at their annual sale. Cheviot wedder lambs (7,411) averaged £42.62 (-£5.53 on the year) and sold to £72.00 gross from Burnbank, Isle of Canna. Cheviot ewe lambs (1,665) averaged £43.72 (-£2.67 on the year) and sold to £88.00 gross from 186 Migdale, Bonar Bridge. Cross lambs (4,393) averaged £52.55 (-£1.08 on the year) and sold to £77.50 gross for Texel crosses from Beallachnagore Farm, Strathpeffer. In the cheviot section only the tops that were looking as good as last year matched last week’s price. Second and third draw lambs were more difficult to cash. Cross lambs met a good demand with tight skinned and fleshy types selling particularly well. Mid Sutherland: Cheviot wedder lambs – Midfearn Farms, Ardgay, £59.50, Wester Fearn, Ardgay, £59, Humpton, Spinningdale, £57; Cheviot ewe lambs – Wester Fearn, Ardgay, £72; TexX – 12 Airdens, Bonar Bridge, £63.50. Skye and Outer Isles: Cheviot wedder lambs – 5 Harlosh, Dunvegan, £58, Isle of Canna, Canna, £57, Uiginish Farm, Dunvegan, £56.50; Cheviot ewe lambs – Burnbank, Isle of Canna, £72, 5 Mill Park, Isle of Raasay, £53.50, Gesto Farm, Struan, £48; Cross – The Millcroft, Claddach Kyle, £64.50; TexX – 25 Fasach, Glendale, £62. Caithness: Cheviot wedder lambs – Stonecroft, Thrumster, £58.50; Cheviot ewe lambs – Knockinnon, Dunbeath, £78; TexX – Guidebest, Latheron & Weydale Mains, Thurso, £63. East Sutherland: Cheviot wedder lambs – Carrol farm, Brora, £58, 185 Migdale, Bonar Bridge, £55.50, Braelangwell Farm, Ardgay & Milton Muie, Rogart £55; Cheviot ewe lambs – Carrol Farm, £64; SuffX – Culmaily Farm, Golspie, £65.50. West Sutherland: Cheviot wedder lambs – Saluscraggie, Helmsdale, £55; Cheviot ewe lambs – Saluscraggie, £53; TexX – Carnich, Gruids, £69.50. Inverness and South: Cheviot wedder lambs – Tullyglens, Dunphail, £63, Erchite, Dores & Castle Grant Home Farm, Grantown on Spey £59; Cheviot ewe lambs – Lynemore Farm, Grantown on Spey, £64, West View, Inverness, £57; BeltX – Tullyglens, £72; SuffX – Strone Cottage, Newtonmore, £63.50. 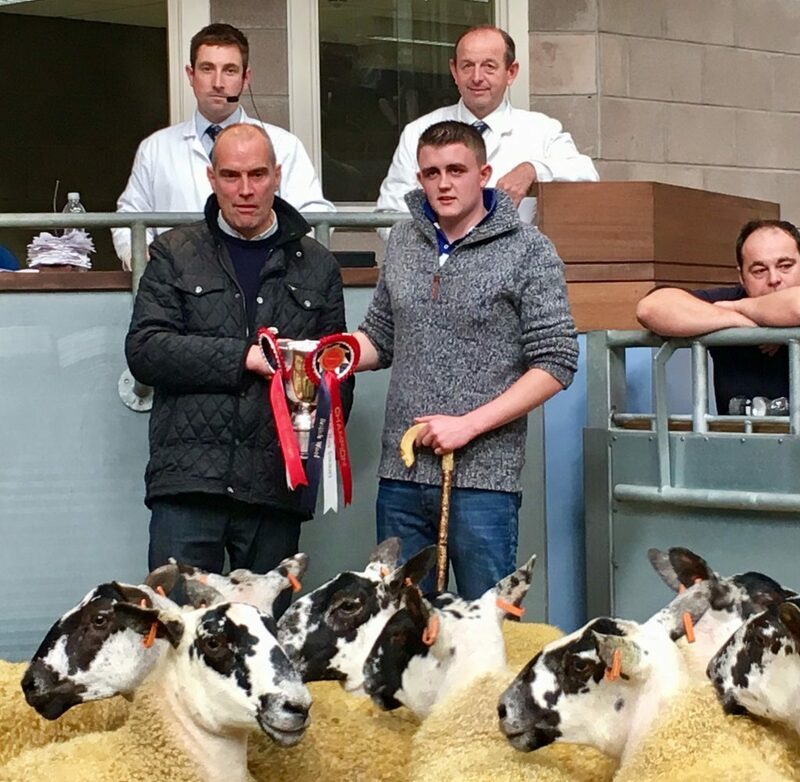 Ross shire and Black Isle: Cheviot wedder lambs – Kintail, Newton of Ferintosh, £56, Pithogarty, Tain, £55, Comar, Cannich, £54; Cheviot ewe lambs – Auchmore Farm, Muir of Ord, £54, Kirksheaf, Tain, £48; TexX – Beallachnagore Farm, £76; BeltX – Lower Geanies, Fearn, £72.50; Cross – Bogallan, North Kessock, £63; CharX – Craiglea Croft, Duncanston, £61.50. Wester Ross: Cheviot wedder lambs – Aird, Shieldaig, £60, 13 Kirkton Gardens, Lochcarron, £55.50, Inverpolly, Ullapool, £55; Cheviot ewe lambs – Achnaclerach, Garve, £54; TexX – 13 Kirkton Gardens & Keppoch Farm, Dundonnell, £64.50. United Auctions, Stirling, Saturday August 26, had catalogue entry, with 4,911 Scotch Mule, TexX & SuffX gimmers sponsored by British Wool and ably judges by S Rodger, Firth Mains. The championship was won by M/s McKenzie, Ardgate and purchased by SRUC Oatridge. Overall average £130.62 (+£7.14)on the year. Texel Cross Gimmers £136.90 (+23.15) on the year. Stirling; United Auctions (Thursday August 24) sold 6484 Prime Sheep including 4606 lambs average 184.2p/kg and 1878 ewes and rams. Lambs (4606) Auchenrivoch and Leaston (Tex) £100; Doune Farms (BTex) £100; Pathhead (Suff) £98; Shanry (Char) £94; Glenisla (Mule) £78, Ballagan (BF) £75. Lambs (4606) Auchenrivoch (BTex) 219p; Candy (Suff) 194p; Harviesmailing (Bel) 233p; West Park (Char) 202p; Knock O Ronald (Mule) 179p, East Mill (BF) 158p. Ewes (1878)- Woodhead of Cairness (BL) £100; Mansfield (Tex) £95; Whitburgh Mains (Suff) £94; Easter Deans (BFL) £83; Wester Arngibbon (Chev) £80; Parks of Garden (Mule) £73; Wester Highgate (BF) £67.00. Tups – Auchlin (Tex) £123; Wood (X) £87; Hardiston (Bel) £86. Caledonian Marts Ltd , Thursday August 24, sold 153 cattle comprising 90 Prime Bullocks Heifers and Young Bulls, 63 Cast Cows and Bulls. Numbers were exceptionally short of requirements, with all classes recording record averages so far for this season. Bullocks sold to 252p for a Limousin from J&J Wyllie, Knockhouse, Dunfermline purchased by Hugh Black & Sons Butchers and to £1905 for a Charolais from C Smith, South Flanders, Kippen. Heifers to 250p (twice) from Brockwoodlees, Canonbie purchased by W.W Wales Ltd, Kilmarnock & Hugh Black & Sons and to £1620 from the same farm. Young Bulls to 215ppkg for a Limousin from Mains of Throsk, Stirling to J.F Findlay Ltd, Wishaw and to £1457 form the same farm. 248ppkg Easter Ochtermuthill,Towncroft (Young) and Brockwoodlees. Beef Cows averaged 143p selling to £1500 from B Harper, Greenwells, Falkirk and to 185.5p for the same beast. With a very poor show of Dairy Cows it resulted in an average of 98p, selling to 106p from W Hamilton & Sons, Meldrum, Stirling and to £780 from the same home. DINGWALL, Dingwall & Highland Marts Ltd, (August 25) sold 101 rams at its sixth annual ‘Great from Grass’ on farm sale of rams at Fearn Farm, Tain, on behalf of Messrs J Scott & Partners. A great show of shearlings on offer met a stronger demand than the year before, with all rams finding a new home. Texel shearlings (34) averaged £822.44 and sold to 1,250 guineas thrice; New Zealand Suffolk shearlings (24) averaged £815.94 and sold to 1050 guineas; Beltex & Beltex x Suffolk shearlings (5) averaged £504 and sold to 550 guineas twice; Aberfield shearlings (38) averaged £860.72 and sold to 1,300 guineas twice. Other leading prices per head in guineas – Texel shearlings – 1150g, 1050g, 1000g; NZ Suffolk shearlings – 950g (thrice), 900g (4 times), 850g (twice); Beltex shearlings – 450g (twice), 400g; Aberfield shearlings – 1200g, 1150g, 1100g (4 times). 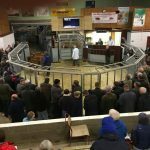 Dalmally Auction Mart, Saturday August 26. United Auctions held their second sale of all classes’ lambs and sheep. With an increased entry on the year, 4,705 head was sold. A good show of quality lambs were on offer, consisting mainly of smaller long keeping types. A good ringside of buyers was present from across the country. £64.00 – Crinan : £62.00 – Kiloran Farmers, Colonsay. £75.00 – Bonawe Home Farm : £72.00 – Ormsary Farmers : £67.00 – 2 Bonawe Croft : £65.50 – Stonefield Farms : £65.00 – Inchgarth Farm : £61.50 – Brackley Parks : £60.50 – Tullochcan & Clachan Farm. £77.50 – Ormsary Farmers : £68.00 – 2 Bonawe Croft. £56.00 – Kilchattan, Colonsay : £54.00 – Ardsheal Farm & 14 Cleat, Barra. £50.50 – Blarmafoldach : £48.00 – 83 Borve, Barra : £47.00 – Stroneskar : £46.00 – Garrogie Estates & Littleport : £44.50 – Ederline Estate : £43.50 – Castles Estate : £40.50 – Homefield Croft, Colonsay. £58.00 – 2 Bonawe Croft. £86.00 – 2 Bonawe Croft. 183p & 174p – Kiloran Farmers, Colonsay : 173p – Barbreck : 171p – Strathoich. 207p – Barbreck, Lochgilphead : 196p – Barguillean : 188p – Slatich : 184p – Inchgarth & Garvachy : 183p – Ederline Estate & Barbreck Lochgilphead : 181p – Brackley Parks : 180p – High Balantyre : 179p – Barbreck Lochgilphead : 178p – Tullochcan : 176p – 2 Bonawe Croft : 175p – Garvachy : 174p – Tullochcan : 173p – Stonefield Farm & Ormsary Farmers : 172p – Inchgarth, Garvachy & Keppochan : 171p – Ederline Estate, Stonefield Farm, Tullochcan & Slatich. 180p & 179p – Strathoich : 175p – Machrins : 172p – Keppochan, Gallachoille & Machrins Farm : 170p – 2 Bonawe Croft. 164p – Balnahard, Colonsay : 163p – Ardsheal Farm & Bonawe Home Farm. 159p & 157p – Ormsary Farmers. 161p – Garrogie Estate : 157p – Stroneskar. £1280 – Ballimartin : £1080 & £970 – Blackrock. £1320 – Blackrock : £1180(2) – Ardbeg : £1180 – Blackrock : £1170(2) – Ballimartin : £1140(5) – Ardbeg : £1130 – Blackrock & Starchmill : £1120(4) – Ardbeg : £1110(5) – Blackrock : £1110 & £1050 – Claggan : £1050(2) – Starchmill : £1030 & £1000(2) – Kilchiaran : £1000 – Claggan(2), Ballimartin(2) & Ardbeg(6). £1180 – Aoradh : £970(2) – Ballimartin. £1010(2) – Lossit : £1000 – Ardbeg(4), Greanan(2) & Claggan : £940 – Ardbeg(4) & Ballimartin(3). 238p & 236p(2) – Ballimartin. 312p(6) & 252p – Blackrock : 251p – Aoradh. 313p – Blackrock : 289p(6) – Ardbeg : 288p(5) & 285p – Blackrock : 281p – Kilchiaran : 277p & 274p – Starchmill : 272p(4) – Ardbeg : 270p(4) – Claggan : 269p(2) – Ardbeg : 267p(2) – Ballimartin : 266p – Blackrock : 265p(2) – Claggan : 264p(2), 263p & 260p – Starchmill. 280p(2) & 243p(2) – Blackrock. 262p(4) & 259p(7) – Ardbeg : 256p(2) – Claggan & Ardbeg : 253p(2) – Lossit : 251p(2), 247p(2) & 245p(2) – Claggan. £1750, £1500 & £1450 – Blackpark. £1850, £1250 & £1200 – Blackpark. £2100 & £1900 – Blackpark. £1800(2) & £1700 – Blackpark. the year. Lambs averaged £57.45 per head or 162.1 pence per kilo. Estate : £70.50 – 16 Westend : £70.00 – Smaladh. Westend : £76.50 – Tallant : £76.00 &amp; £73.50 – Daill Cottage : £73.00 – Blackrock. £56.50 – Ballivicar : £55.00 – Foreland No2. £45.50 – Oransay : £43.50 – Lorgba. £89.50 – Carrabus : £80.50 – Gartloist : £78.50 – Ardbeg : £64.50 – Carrabus. £69.50 &amp; £60.00 – Octofad. &amp; Ardtalla Estate : 168p – Claggan, Ardnave, Ballachlaven &amp; Islay Estates. : 168p – Leorin, Talant &amp; 16 Westend. 153p – Balivicar : 150p – Foreland No2.